Spring...Weddings, mother's day & housewarmings. Gift high quality specialty cutting boards. We're the leading online seller of high-quality wood countertops and butcher block kitchen islands, plus kitchen furniture, equipment and accessories. But our name sums it up: we specialize in butcherblock. 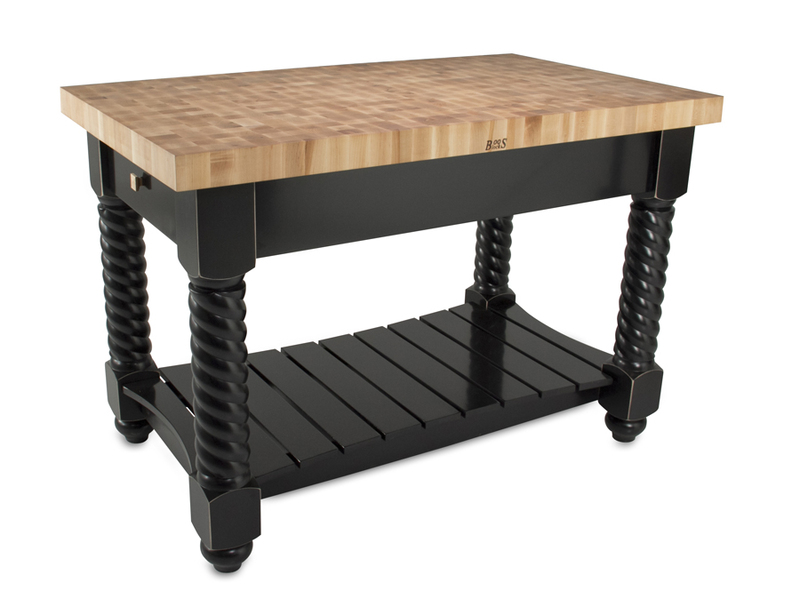 BB Co. sells everything from old-fashioned butchers' blocks to modern kitchen islands with seating; from rolling carts to butcher block tables; from small cutting boards and chopping blocks to expansive cutting board tables and kitchen island butcher block tops. Not only do we offer the best assortment of products for residential kitchens and home cooks, we also offer a wide range of products designed for commercial kitchens and embraced by professional chefs. Butchers use blocks constructed in a number of different styles. Visit our Help Center for an explanation of the differences. There you’ll learn that edge-grain boards feature long wooden rails that run the full length of the block, providing an especially clean look of continuity. In contrast, each ribbon of a Blended block incorporates multiple wood pieces finger-jointed together. End-grain butcher boards are created by arranging short strips of wood standing on ends, creating a beautiful checkerboard design and a tough, resilient cutting surface comprised of millions of wood fibers. We sell our own line of BB Co. butcher block and plank countertops, plus countertops made by John Boos & Co. Boos countertops come in premium, residential, commercial and industrial grades. Any Boos end grain block will make a spectacular butcher block island countertop. While any professional chef is likely to prefer the same, he or she might have to settle for an edge-grain butcher block top island since they’re a bit more affordable. Boos counter and kitchen island tops come in four different species of North American hardwood: maple, cherry, red oak and walnut; three different grain styles: edge, end and blended (aka finger-jointed edge grain); and seven different thicknesses - from 1-1/2 inches up to 7 inches. A wide array of standard sizes (i.e., popular length, width and thickness combinations) is available. With so many off-the-shelf sizes to choose from, chances are you’ll find a standard-size offering that suits your needs. But if you can’t, you’ll find it a breeze to specify, price and purchase a custom butcher block island top or countertop designed and made to your exact specifications. We can accommodate nearly any request for a custom Boos countertop of specific length and width (discrete thickness options are dictated). You don’t have to wait days for a custom quote, as is the case with other online stores and brick & mortar kitchen stores. Just visit Boos custom counter and island tops. Specify your requirements then view in an instant your online price quote. You’ll have the option of completing your custom order at that time, or getting back to us later, since we keep all price quotes on file. We can handle mitered cuts and sink or stove cutouts too. Plus, we offer NSF-approved countertops for food-service kitchens and cost-effective industrial-grade tops for tool shop workbenches, job shops or manufacturing plants. Butcher Block Co. wood countertops are available in 15 different species of wood. Plus, we offer extra-large countertops; hand-scraped tops that deliver an authentic, rustic look; and plank-style countertops. All our butcher block island tops and counter tops are made to order, and you can even specify a custom thickness and obtain a price quote instantly. Live edge table tops and counter tops are an excellent way to bring the great outdoors into your home. Most of our wood slabs feature two live edges along their long edges. Each is finished with conversion varnish for long-term protection. 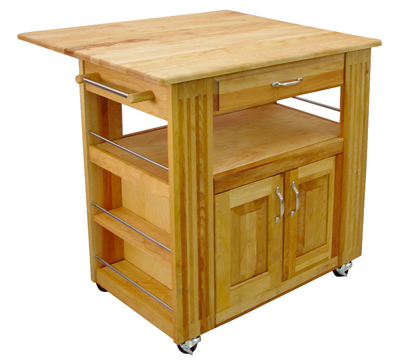 We sell standing and movable blocks as small as 24” by 24” and stationary or portable kitchen islands as large as 60” by 36”; with and without shelves and drop leaves, utensil drawers, sliding storage baskets and caster wheels; and designed to provide maximum storage. You can choose a butchers block island featuring maple, walnut, cherry or ash. 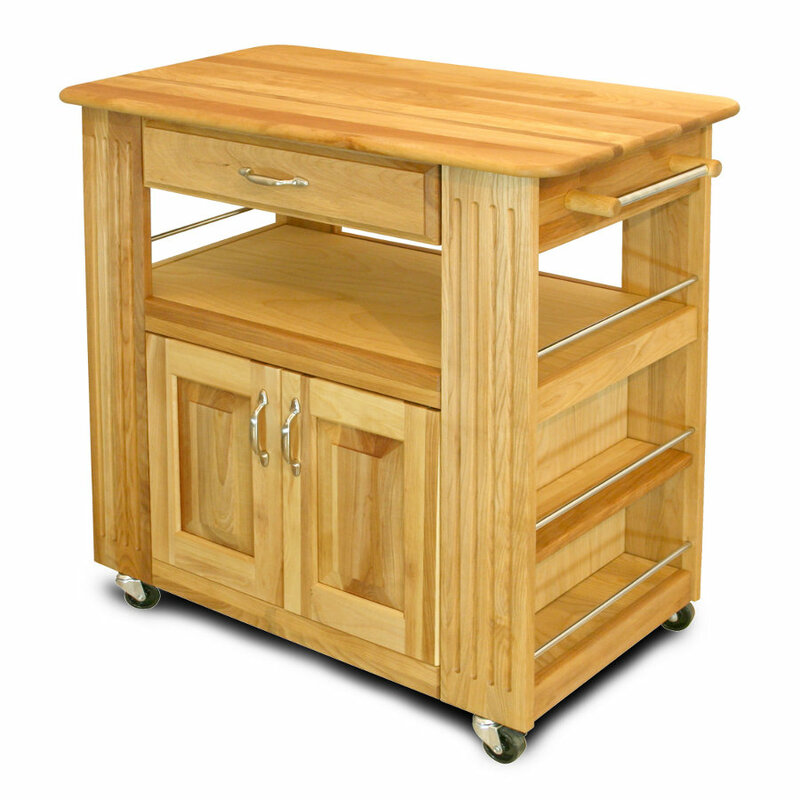 Our lineup of kitchen carts is equally broad. Whether you’re after a microwave cart, a BBQ cart with a stainless-steel top or a prep cart with a hole in its worktop that makes it easy to dispose of scraps. 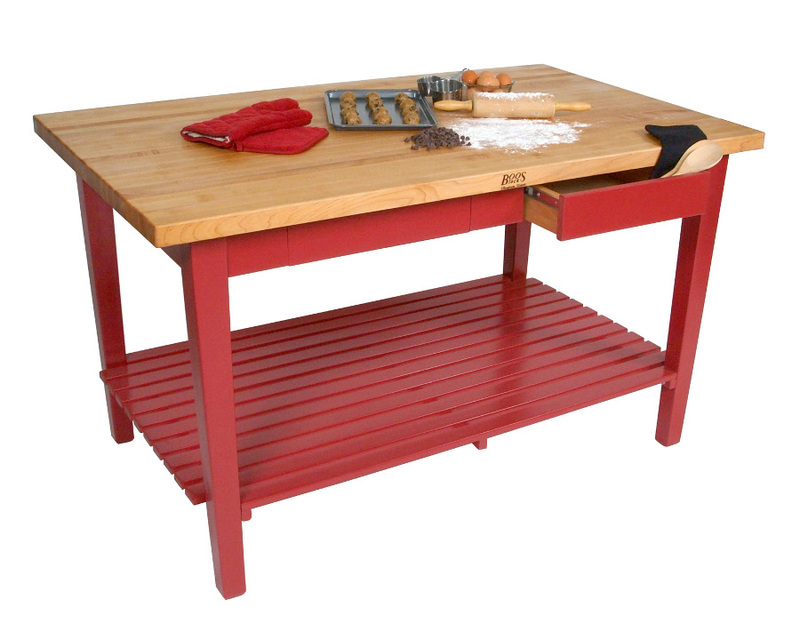 Many John Boos butcher's blocks, kitchen tables, islands and carts can be ordered with a colorful painted or stained base. Your options include soothing, subtle colors, as well as more stimulating colors. You can view our extensive catalog by product type then narrow your options by filtering for one or more material types - including maple, cherry, oak, walnut, birch and teak, among other woods. If you’re searching for a piece of furniture, such as a butcher block island or table, you can narrow your choices based on length, width and height. 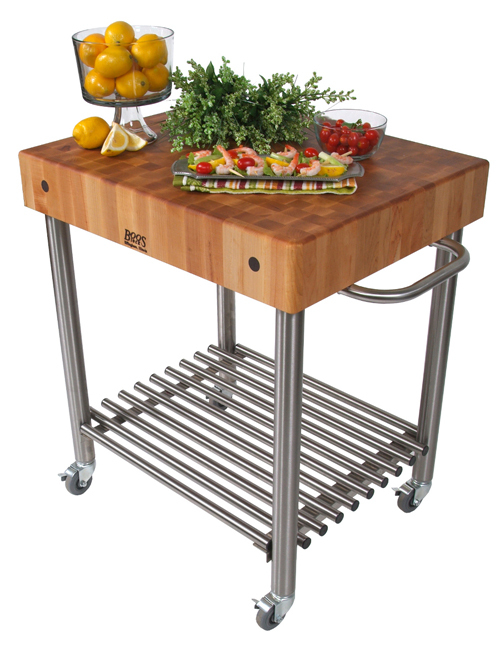 If you’re shopping for a kitchen island table you can use as a work station, or searching for a kitchen cart that can double as a versatile prep station, and you have in mind a particular type of butcher's top, such as edge-grain maple or end-grain walnut, use our grain style and material filters. Of course, you can use those same filters to find a cutting board, chopping block or wood counter top that meet your needs. Cutting Boards, Chopping Blocks and Carving Boards Galore! We carry all types of wood cutting boards, ranging from small, maple bread or cheese boards, to mid-size cherry or walnut serving boards to large cutting boards used by professional chefs. If you need a carving board with a juice groove, or metal or wood spikes that hold meat in place for easier carving, look no further. End-grain boards designed for serious chopping are our specialty. They come in various wood types and thicknesses, and many are reversible. Whether you’re in need of a single knife or a 2, 3 or 4-knife set for your own kitchen, or you’re searching for a spectacular knife block gift set for a true gourmet, you’ll be delighted to discover our wide assortment of kitchen knives. Choose a general-purpose utility knife, or one for carving or paring, for boning or filleting. We even offer cutlery specially designed for narrow tasks such as shucking oysters; slicing tomatoes, ham and salmon; chopping vegetables; or shearing poultry. While you’re at it, pick up a gorgeous wooden knife block. Choose a standalone block to house your current collection of cutlery, or one that comes with 4, 7 or 9 knives in a stunning set. We have scoured the market and assembled a collection of some of the finest kitchen brand names you’ll find anywhere. We can save you time, money and aggravation. A knowledgeable customer service agent is almost always available to answer your questions by phone or email. You’ll also want to check out the exhaustive library of answers to FAQs and comparative and how-to guides posted in our Help Center. Plus, we provide over 20 short videos that introduce our most popular brands, product types and top sellers. Actually, it was John Boos' father, Conrad, who made the first Boos Block in 1887 in Central Illinois. Those early Boos Blocks were used by blacksmiths, who until that time did their heavy hammering and pounding on tree stumps. By adding sturdy legs to thick sycamore slabs sliced from tree trunks, Boos and his son John created a heavy-duty work table perfectly suited for smithies’ rugged chores. When the younger Boos discovered that local Midwestern meat butchers’ shops had a similar need for an exceptionally sturdy wood work table on which they could chop and pound with abandon, the butcher's block was born. 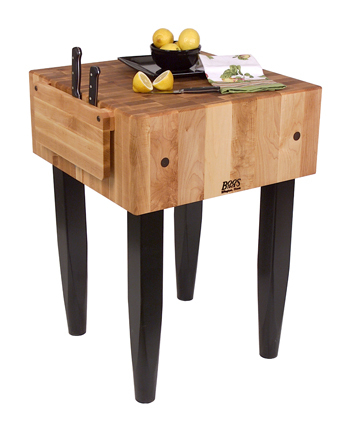 Over time, Boos & Co. expanded its product line to include everything from cutting and chopping boards to countertops, and even kitchen carts, tables and islands. Next Boos expanded into commercial restaurant equipment – a market which the company now leads. 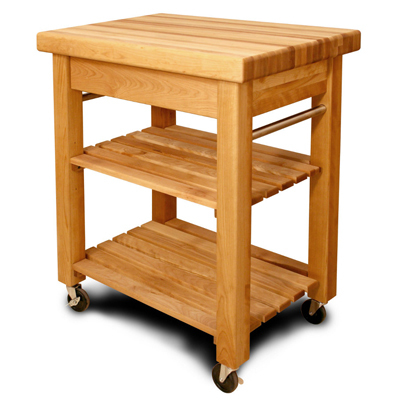 Commercial bakeries treasure Boos-made, maple-top baker's tables equipped with risers that help keep foodstuff on the table and off the floor, making cleanup quick and easy. Restaurants and delis, as well as industrial and food plants, trust the company’s stainless steel work tables and enclosed-base cabinets, as well as their commercial sinks. And you’ll find Boos dining table tops in eating establishments of all sizes and styles. They come in maple, cherry, oak and walnut and in edge-grain or blended construction styles. Whether you use your Created Hardwood LTD live-edge slab as a top for a kitchen counter or a dining table, you’ll love introducing your home to the great outdoors. There’s no better way to relish the beauty of Mother Nature than by admiring it and dining on it everyday. Created Hardwood also makes stunning metal bases for wood-top tables. You’ll have eleven different models to choose from. These metal table bases are made of cold rolled steel and provide solid support for wood table tops of many different styles - butcher block, plank-style or live-edge wood slabs.. Models span the ages, as well as styles, ranging from classical to traditional to contemporary. Located in the Catskill Mountains, this industry leader uses yellow birch hardwood harvested nearby in all its products. Their furniture line includes islands that provide vast storage space; mid-sized workstations with and without drop leaves that expand available work space; microwave carts with and without hutches; and economical basket carts and kitchen trolleys that can make small kitchens more productive. Catskill is also well known for their stunning face-grain cutting boards and end-grain chopping blocks. The professional chef duo of Chris and Chris have designed an array of space-saving carts that feature their innovative Chop and Drop sanitary disposal system. You can use this nifty feature – a hole cut in the cart’s work surface – to collect your carvings for immediate or later use, or to gather up scraps left over from your food prep for especially easy, non-messy disposal. Teak is perfectly suited for cutting boards, given its composition. The wood's high oily-resin content helps it repel moisture, protecting it from warping. 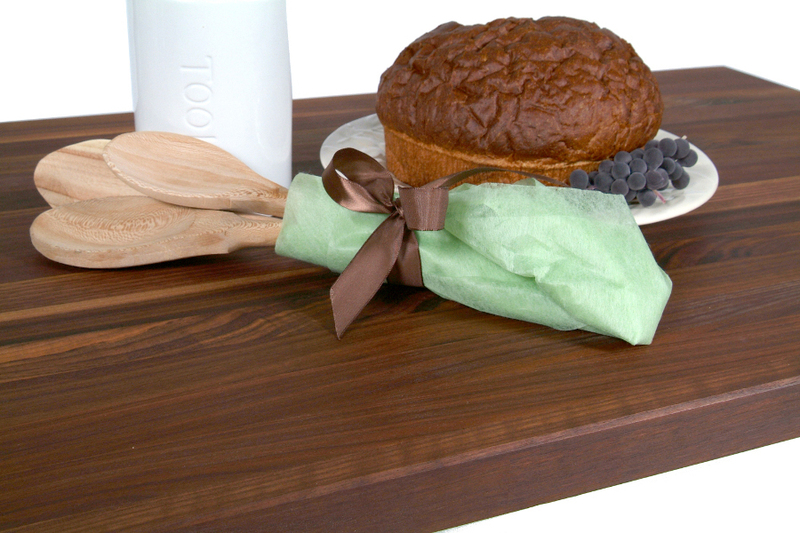 If you like teak or are seeking a cutting board with a remarkable look that makes the perfect gift for a gourmet, then be sure to check out Teak Haus' collection of teak cutting boards and chopping blocks. These extraordinary kitchen knives feature a unique handle design conceived by F.A. Porsche – famous for designing the original Porsche 911. Expertly-balanced, they’re especially comfortable to hold and easy to control. Chroma knives are made of Japanese steel, renowned for its structural integrity and incredible sharpness. The blades of these remarkable knives are ground by hand and able to hold their razor-sharp edges longer than regular knives. You’ll find them superior with respect to their looks, functionality and long-lasting prowess. Artelegno is an Italian woodcrafting studio famous for their exquisite wood blocks designed for storing and protecting kitchen knives. Their experienced craftsmen use only the finest European beechwood in creating fabulous-looking knife storage solutions. Of course, they offer traditional knife blocks with slots, but their line is so much broader. It includes multi-panel designs with magnets, plus box and paddle wheel configurations that are anything but conventional. Add an Artelegno block to your kitchen and you’ll be hard-pressed to decide which you value more highly – its exquisite looks or its ability to keep knives handy, yet safe and protected. Finding It Difficult to Make Up Your Mind? Give Us a Call. With so many great products, brands and styles to choose from, it’s easy to feel overwhelmed. 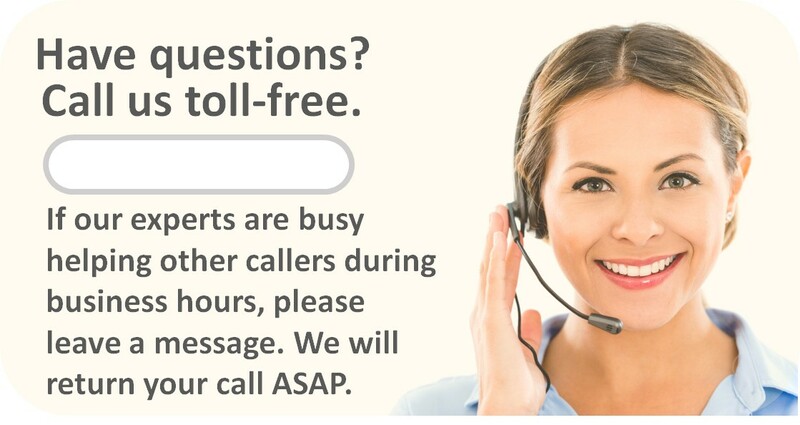 Our experts are available during normal business hours to answer your questions and to help you through the decision-making and ordering processes. Or shoot us an email. We'd love to hear from you.